April 1, 2019 / Filed under Blog, Long Range Transportation Plan. Every day throughout Pinellas County, our residents and visitors look to walk and bike to a variety of destinations safely and efficiently. Whether your destinations include some of our most notable beaches or parks, one of our various employers, or one of our vibrant downtowns, chances are you can think of a few ways your routes could be improved. Walkers traverse the Pinellas Trail through downtown Dunedin. A new tool will allow you to communicate those needs and have them incorporated into a plan for biking and walking countywide. With the Bicycle Pedestrian Master Plan Data Viewer, we aim to get as much feedback as possible from Pinellas County residents, as well as visitors from the wider Tampa Bay region and beyond. Whether you regularly walk or bike throughout the county, are a casual bicyclist or walker, or if you see too many obstacles to being able to do so, this tool is for you. Over the next several months, Forward Pinellas is developing a new long range transportation plan looking ahead from now to 2045: Advantage Pinellas, a strategic plan to improve mobility and economic opportunity countywide. As part of that plan, we are developing a new Bicycle Pedestrian Master Plan for Pinellas County. 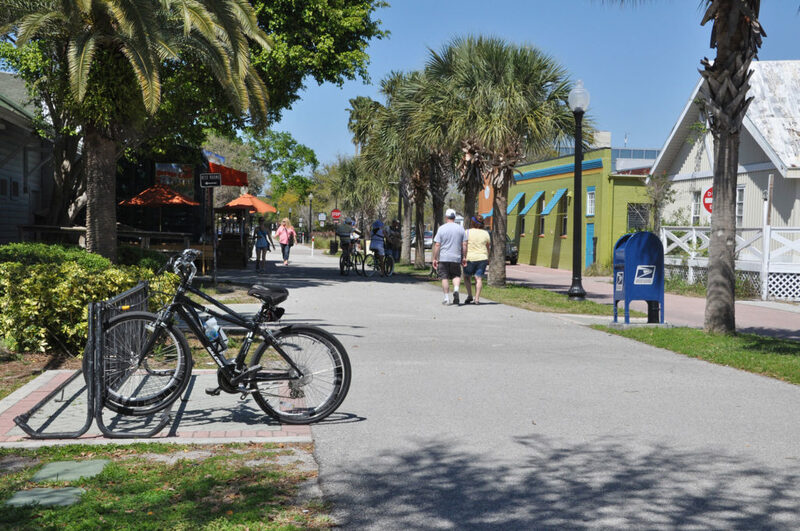 This planning effort – Advantage Pinellas: Active Transportation – will identify current conditions, gaps, and opportunities for increasing transportation options throughout the county. The responses from this crowd sourcing tool will be critical as we develop the plan. Submit places you walk or bike, routes you walk or bike, routes you would like to walk or bike, and obstacles to walking or biking by selecting one of the associated tabs on the right-hand side of the crowd sourcing tool application and selecting SUBMIT. Select the destinations you are visiting, the type of route you walk or, and the type of obstacles you face on your routes. Submit comments to add more detail to the content of your submission. “Heart” other people’s submissions to indicate that you agree. View additional tabs outside of the crowd sourcing tool to better visualize information in regard to areas of concern, trail networks, local destinations, social equity, level of traffic stress, and more. Click the image above to go to the data viewer tool. For a more detailed breakdown of how to use the crowd sourcing application, please download our step by step tutorial. Submissions will close on May 20, 2019 . For more information about the Bicycle Pedestrian Master Plan Data Viewer, please contact Jared Austin at jaustin@forwardpinellas.org. Note: This tool is being used for planning purposes and not real-time responses to maintenance issues, hazards, or personal security concerns. To report these type of issues, please use Pinellas County See Click Fix.